Wikipedia defines a risk management plan (RMP) as “a document that a project manager prepares to foresee risks, estimate impact and define responses.” If you don’t have a RMP, you need to develop one. Once you have created a RMP, then you should review it with your roofing insurance agent. Your contractors’ insurance includes your general liability and workers’ compensation. These two types of coverage form the backstop for your risk management strategy. That’s why it’s crucial to consult your roofing insurance agent when evaluating your risk management plan. 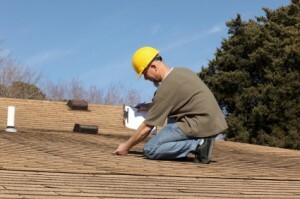 What you want to find out from your roofing insurance agent focuses on three questions. One, is your RMP in accordance with industry regulations? Regulations impact on risk management, and your agent might be aware of regulations that you’ve overlooked. Two, is there any improvements that your agent could suggest to your safety plan? Most importantly, three, how do general liability and workers’ compensation claims impact on each of the policies? Avoid Risk by creating a plan, where you circumvent the risk. For example, if you’re repairing a roof deck, you might lower the structure to the ground to avoid fall risks that you might incur if you repaired the deck at roof level. Control or Mitigate Risk: When you devise a safety plan, you are controlling or mitigating the inherent risks of your roofing occupation. You’re acknowledging the risks and implementing strategies to deal with these hazards. Transfer Risk: You can transfer risk by outsourcing it to an insurance company or by outsourcing the activity. When you purchase roofing insurance and specifically workers’ compensation or general liability policies, you shift the liability for customer damages and worker injuries to your insurance company. Likewise, if you outsource your waste management, then the risk for deposing of your debris falls on the waste management company. Accept Risk and Budget Cost: Falls are an inherent risk in the roofing industry. The price of fall-prevention equipment is a cost that roofing companies accept and budget for. A risk assessment matrix defines the probability and severity of harm and specifies what the response will be to these issues. Risk is assessed on four levels, and these assessments can be done project-by-project, quarterly or annually; whichever timeframe yields the most meaningful data. Your roofing insurance, which consists of your general liability and workers’ compensation, makes up a major part of your risk-management strategy. However, a safety plan, risk- assessment matrix and risk-management strategies comprise the package of steps that you need to complete to protect your company against unexpected liabilities.